The Global Gypsum Knowledge Base is an archive of Global Gypsum Magazine since 2007, the Global Gypsum Directory and presentations/papers from the Global Gypsum Conference since 2007. Global Gypsum is well-known as the foremost source of information for the global gypsum industry. Global Gypsum Magazine has published all the news available on the industry for more than a decade, as well as including articles on market developments, country reports and technical articles on production advances. The Global Gypsum Conference annually showcases developments in the global gypsum industry, not only in market trends, but also in production and technology advances. The event is the 'must-attend' conference and exhibition for all gypsum professionals. 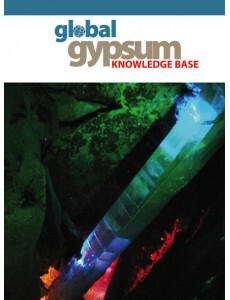 The Global Gypsum Knowledge Base is presented in PDF format on a fully-searchable DVD. Paper 8: Enhanced gypsum products through the ‘Give Me Five Method (5kg/m2 of gypsum board) to obtain a fast penetration in South America’s non-board, traditional market: Marcelo Pereira: Aswell S.A.
Paper 22: Increasing energy efficiency at gypsum and gypsum wallboard plants with gas turbine cogeneration: Anshuman Pandey: OPRA Turbines B.V.
Paper 2 The gypsum industry and climate change: Bob Bruce: The Nugyp Corp.
Paper 16 Anhydrite outdoors: Innovative new applications: Luca Plakopitis, Fluorsid S.p.A.
Paper 17 The application of fuel and air ratio controls for combustion systems: Technical considerations for gypsum wallboard manufacturing: Dustin Neumann: Neumann Process Control, Inc.
Paper 8: Gyptech Stucco Analyser: The new essential tool: Jeffrey Warren: Gypsum Technologies Inc.
Paper 9: Maximising plant energy efficiency: An analytical approach to prioritising and implementing energy-saving initiatives: Dustin Neumann: Neumann Process Control, Inc.
Paper 13: Bag packaging solutions: Filling of well-known valve bags vs. FFS bags and its advantages: Markus Lackmann: Haver Filling Systems, Inc.
Paper 13 Interaction between admixtures in plasterboard production: Maurizio Bellotto: Giovanni Bozzetto S.p.A.
Paper 1 Global Gypsum Evolution - Turbulent times continue and the gypsum industry is evolving as expected. What lies ahead? : Bob Bruce: Innogyps Inc.
Paper 4 Wallboard dryer operational strategies - Emphasizing quality in a low volume market: Dustin Neumann: Neumann Process Control Inc.
Paper 10 Formaldehyde free naphthalene sulfonic polymers as liquefiers for the production of plasterboards: Maurizio Bellotto: Giovanni Bozzetto S.p.A.
Paper 18 Bed storage and blending applied to gypsum: Simon Wintz: Claudius Peters Technologies S.A.
Paper 11 Manufacturing gypsum wallboard using solar power: Rod MacGregor: CleanBoard: Inc.
Paper 15 Fundamentals of gypsum storage and handling: What you need to know: Francisco Cabrejos: Jenike & Johanson Inc.
Paper 3 Development of market & capacity of gypsum board in the Middle East: Isabel Knauf: Knauf A.S.
Paper 9 What's new in water reduction? : Charlie Blow BTech: CasoFour Ltd.
Paper 12 Recycling of plasterboard waste - from 'nice to have' to necessity: Henrik Lund-Nielsen: Gypsum Recycling.